Aloha, Goddess, Breath, Fresh, Lovely, Sage. Lavender. All our products are hand made, in small batches with the highest quality essential oil and carriers. 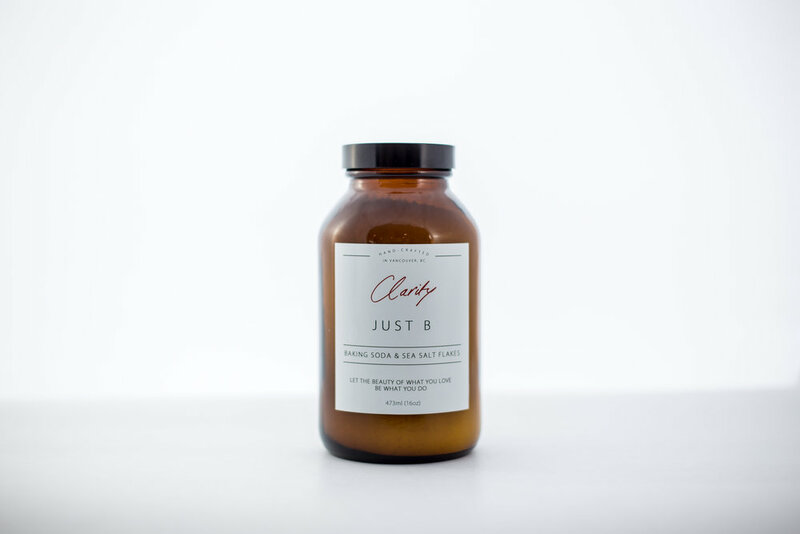 Our body and bath oil is the perfect balance of pleasure and therapeutic function. Made with 80% carry oils designed for anti inflammatory, put directly on the skin or in the bath. Available in seven signature Clarity scents: Aloha, Goddess, Breath, Fresh, Lovely, Sage. Lavender. All our products are hand made, in small batches with the highest quality essential oil and carriers. We love simple and beautiful products that work!Our body butter is made with pure organic Shea butter and organic coconut cream. This moisturizing and rejuvenating cream can be applied anywhere on your body. Amazing for people who have super sensitive skin. Perfect for expecting mothers, baby’s bums and everything in between. Unscented. Add this mixture of pure baking soda and pure sea salt to your bath and let the minerals ease your tensions and pains away. The combo is so more effective then epson salts, with no toxins and an incredible softening of the skin. Unscented. These pure and concentrated Magnesium Chloride flakes, reduce pain and swelling. Aid in sleep and are amazing for soothing muscles and tension. Be it for travel or at home. These roll ons are pure magic. Concentrate 80% essential oils, mixed with 20% carrier oils designed to help reduce inflammation. Use on your wrists, temples or other focus points these pure essential oils will provide therapeutic effect and make you smell great. Available in seven signature Clarity scents: Aloha, Goddess, Breath, Fresh, Lovely, Sage. Lavender. All our products are hand made, in small batches with the highest quality essential oil and carriers. Hand made in Tofino BC, with Cloud Factory, from local beeswax, this amazing candle will not only clear your space and reduce positives ions but will also increase the warmth and cosyness of any space as well as make it smell naturally wonderful. This product does have a smell of pure beeswax. No other oils or scents have been added. 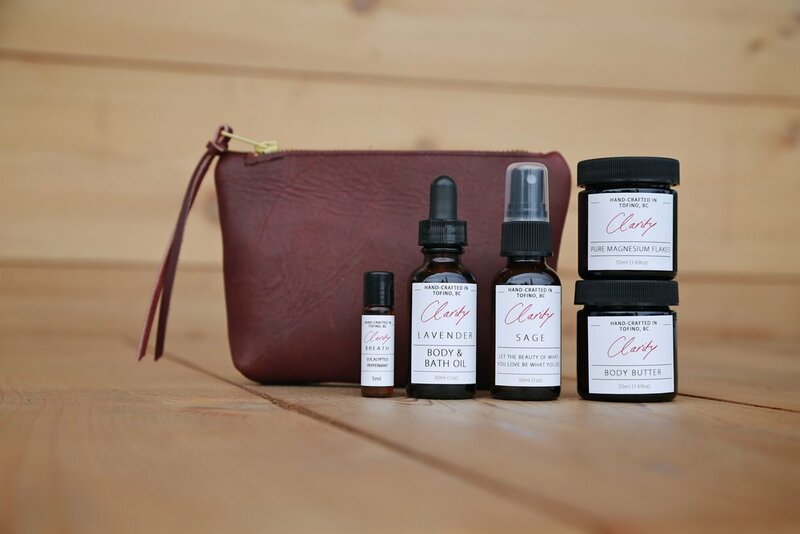 This travel kit has all the elements you need to remain rejuvinated, fresh and relaxed whilst traveling. Wrapped up in a custom, hand stitched leather bag, made by Market Canvas. The kit contains a "Sage" blend spray, "Lavender" bath/body oil, "Breath" blend roll on, Pure Magnesium Flakes, and Body Butter. Please note these are only available for a limited time. Once they are gone, they are gone... so don’t wait!